It was a decision you did not come to lightly, after all, installing a swimming pool is not only a costly feat, but also a liability. You considered all the risks and decided to go for it. Good choice, but now, you want to entertain with your new pool, and your backyard is less than picture perfect after all the construction. There is dirt everywhere and because the trees had to be cut to make room for the pool, there are literally no plants in your backyard any longer. What are you going to do? You are going to call Hutcheson Horticultural, and we will beautify your backyard! From adding breathtaking hardscapes to tropical looking flowers, Hutcheson Horticultural is the answer to your custom pool needs! 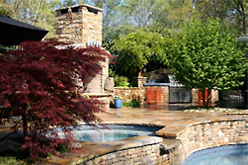 We can turn your barren pool into a backyard oasis in a reasonable amount of time! With our experts in landscaping, you can rest assured that your project will be completed with you, the customer, in mind. You can choose from a variety of hardscape options, as well as our extensive plant list to make your backyard what you have always dreamed it could be! After we customize your pool area, you will be able to throw those summer dinner parties without a second thought! We can also transform other areas of your yard to be even more idyllic than you ever thought possible! With our vast array of flowers, and shrubbery, there is no end to how amazing your yard can look! If you are interested in learning more about our company or how we can help you make your pool a truly enchanting place, contact us!